They only get used for a few weeks a year, at least in Britain, and here we are, in the middle of those few weeks, besieged by glowering clouds and wildly fluctuating temperatures. Enough to make me to think seriously about turning the central heating back on rather than breaking out the ice cream maker. But get over this unseasonal seasonality we must, and this book is a great help in doing just that. I tend to judge ice cream based recipe books on two criteria – do they tell me how to make the stuff in the first place, and are there enough recipes with a bit of a twist to make me want to try a few? Really, it’s that simple – some clear guidance on the mechanics of making ice cream, and a bunch of recipes that stretch beyond a really good vanilla, which, of course, is the absolute pinnacle of ice cream making, but I’m sure you get my drift. 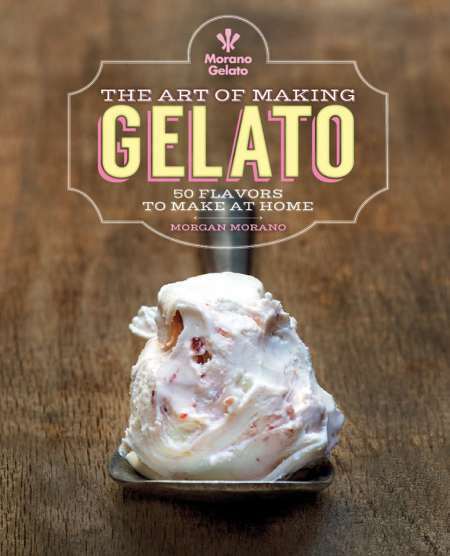 Morgan Morano’s The Art of Making Gelato: 50 Flavors to Make at Home does just that, with a step-by-step run down of the mechanics of the operation, and fifty recipes, including a whole chapter on various combinations of nuts, a recipe for chocolate and red chilli pepper, kiwi, banana (not sure about that …) and a good clutch of sorbets. These are really gelato recipes, a specifically Italian version of ice cream that’s churned more slowly and for longer, up to fifty-five minutes in some cases, which results in a denser, richer result than a traditional ice cream recipe. The basic recipe is supplemented in many cases with some sort of thickener, normally tapioca starch or cornflour, which adds to this density. Morano has the pedigree to back up her recipes – she learnt how to make gelato in Florence under the guidance of the owner of a traditional gelatoria, who apparently traded his skills in ice cream making for a lesson in making a proper New York style cheesecake. Morano was eventually left in charge of producing most of the cafe’s gelato and pastries, before returning to the US to set up her own gelatoria. She now runs an authentic Italian gelato shop in New England, and produces fresh gelato daily. This stuff doesn’t hang around for long, and it’s made fresh in short batches. All in all, a very decent introduction to a sometimes mystifying field. Only grapes and Bananas come in bunches.